The only places I’d been before in the Czech Republic was Prague and Kutna Hora which I’d visited on long weekend breaks. Whilst there are lots of places you must see in Prague, as I’d never ventured further afield I was completely unaware of how much more the Czech Republic has to offer outside of the tourist hotspots. I spent two weeks in the Czech Republic for TBEX Europe 2018 with a gaggle of other travel bloggers. First, we explored Ostrava during some pre and post TBEX tours, then after the conference, we headed off in various directions on FAM trips with Czech Tourism and various partners to discover more of the country. It soon became clear that outside of the cities there are a plethora of fun outdoor adventure activities to partake in. Here are some of the exciting and exhilarating activities we experienced in the Czech Republic. The Děčín Ferrata on Pastýřská Wall is near the Bohemian Switzerland National park in the centre of Děčín. It’s directly opposite Děčín Chateau over the River Elbe. There are a total of 14 ways to climb the wall, each of differing length and difficulty. Ferrata is easily accessible, but it does depend on the weather as climbing isn’t allowed if it’s raining, or when the wall is wet. You pay only for the necessary equipment, otherwise, this attraction is free. Climbing the ferrata is suitable for physically fit individuals even without rock climbing experience. If you’re not sure how to hand the equipment you can arrange an experienced guide to explain everything you need to know. 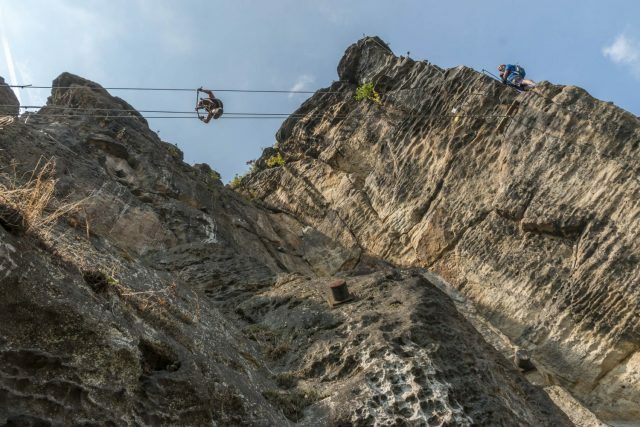 You can rent complete Via Ferrata sets for climbing at Bicycle Rental CYKLOPUJCOVNA which is next to the Pastýřská Wall. You can also arrange an instructor who will go with you on ferrata and show you everything. Don’t worry everyone can speak English or German in this rental shop. The Javoricko Caves in the Olomouc Region of Central Moravia is considered to be the most beautiful cave complex in the Czech Republic. A short 0.5 km uphill hike through a cool and shady forest takes you to the cave’s entrance area. A guided tour leads you through a system of huge chambers, corridors, abysses and joints at several height levels. 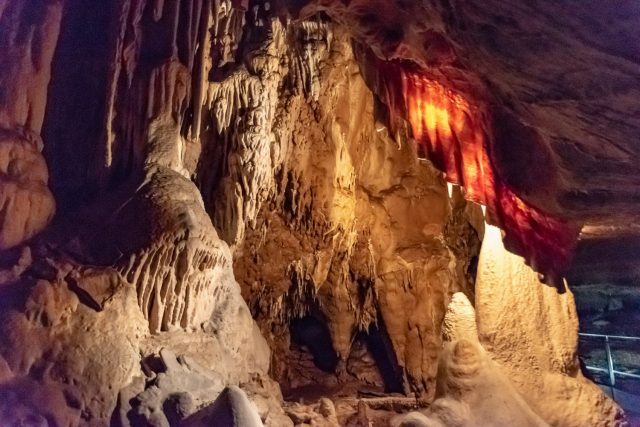 In the process, you will see a variety of amazing stalactite formations in all sorts of shapes and sizes. From a ceiling full of straws to impressive formations in the Cave of Giants to a unique transparent formation called Záclona (Curtain), each room has its own story. The Javoricko Caves are a 45 min drive from Olomouc in the Silesian – Moravian Region of the Czech Republic. There are two tours available: a long tour of 60 minutes for 130 CZK (£4.50) per adult and 70 CZK (£2.40 per child) and a short tour of 40 minutes for 110 CZK (£3.80) per adult and 60 CZK (£2.10) per child. The entrance fee to the caves is also covered by the Olomouc Region Card and opening hours can be found on the Javoricko Caves website. 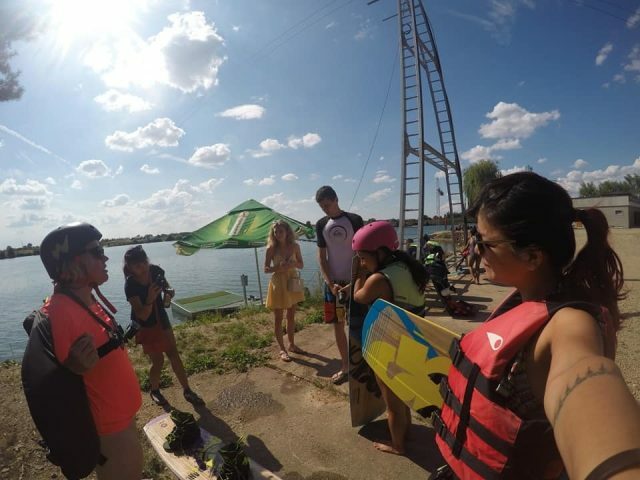 Wakeboarding in the lovely region of Hradec Kralove, as part of my Post Bex tour with Czech Tourism, was simply a blast. As a first time wakeboarder, I had absolutely no idea what to expect. However, as an adventure sports enthusiast, I was excited to give it a whirl. This adventure is a combination of surfing, water skiing and snowboarding. So, if you excel at either of the three, you would perhaps not fall flat on your face, like I did – several times, at that. We enjoyed this epic adrenaline rush at the awesome cable wake park in Hradec Kralove. My experience was a big-time fail as I kept falling and drinking the lake water. However, I would love to try it again and hopefully with some more practice, I can balance myself. The cost for one hour is 300 CZK (£10.35) and 600 CZK (£20.70) for a full day. Seč is in East Bohemia’s Pardubice region. It is easy to reach Pardubice city from Prague on a train and it takes just one hour. From there, Seč is just 28 KMs away and this journey can be done on a car. Seč is perfect for those who love nature and adventure. There is a massive lake here that’s made by Seč dam. The lake is also called Seč. We did paddle boating on Seč lake, which was a lot of fun. There is a little island in the middle of the lake and it is easy to reach there by boat. We rented the paddle boats directly from the beach, which costs as low as 10 euros for an hour. Nestled in the Jeseniky Mountains in the Moravian-Silesian Region of the Czech Republic is the Kopřivná Resort and Bikepark. Ski resort by winter, bike park by summer, Koprivna is an adrenaline junkies playground. Bikepark Kopřivná has some of the best downhill mountain biking trails in Czech Republic, plu a drift triking route, both of which are reached by ski-lift. The four downhill mountain forest biking trails total 12 km. They vary in difficulty from the Fun Trail to the Gravity Line and Downhill trails full of roots, stones, bridges and other obstacles. Being my first time downhill mountain biking I opted for the Fun Trail. Harder than I expected, I had to stop and start to get over the trickier bits. I even somehow managed to embarrassingly fall off…from a stationary position. 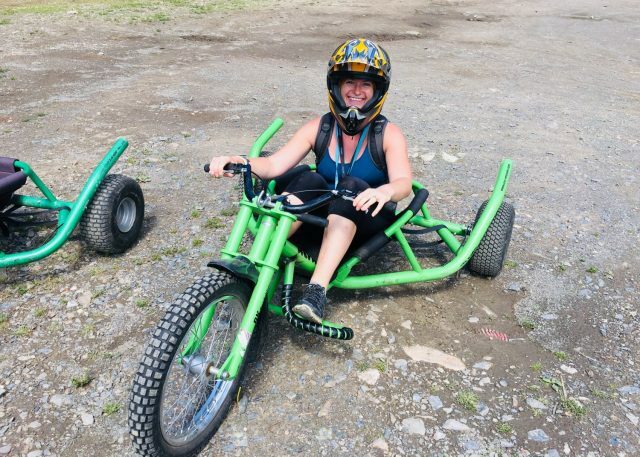 Running outside of the forested mountain bike trails is a downhill drift trike or ‘Bugina’ track. These low tricycles have no pedals but are propelled or ‘drift’ downhill by gravity alone, all you have to do is steer and keep gently on the brakes. This was a bit less nervewracking than the mountain biking but just as much fun. Bikepark prices are very reasonable at 250 CZK (£8.60) for a half-day pass and 390 CZK (£13.40) for a full day. Mountain bike rental is 400 CZK (£13.75) for half a day and 700 CZK (£24.10) for the full day. Another fantastic adventure to be done in the Jeseniky Mountains a downhill scooter ride from Dlouhé Stráně Reservoir. You start your adventure at Kouty Ski Resort, like other ski resorts in the area is also used for a variety of outdoor adventure activities in the summer. After taking the ski-lift and a mini-bus up to the base of the Dlouhé Stráně Reservoir you choose your scooter and helmet. Then all there is to do is to speed back downhill, the whole 17 km of it. Yet another first for me, I must say I was pretty nervous to start with and kept picturing myself falling off or flying off the road. After a while, though I became used to it, relaxed and flew down the roads enjoying the breathtaking views. I was quite disappointed when it came to an end and we arrived back at Kouty Ski Resort. All prices for the ski-lift and scooter rental and opening hours can be found on the Helia Sport Shop website. The Šumava National Park in the South Bohemian region of the Czech Republic along the border with Germany. 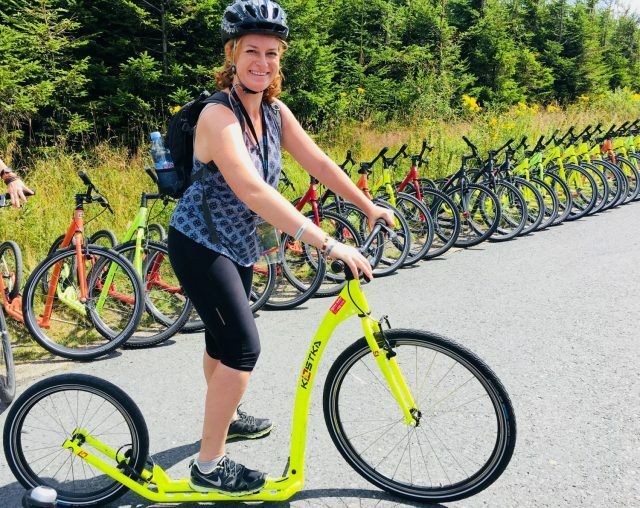 The perfect way to explore this forested landscape called the ”Green Roof of Europe” is by electric mountain bikes (electro-bikes or e-bikes). The best place to start your adventure is from the town of Prachatice at the welcoming Bed & Bike Prachatice where you can also spend the previous night. You can take the e-bikes out yourself, or if you prefer a guide can be arranged. There are plans to open up other recharging stations in the Czech Republic, so soon it should be possible to take e-bikes for multiple days or have different start and end points. 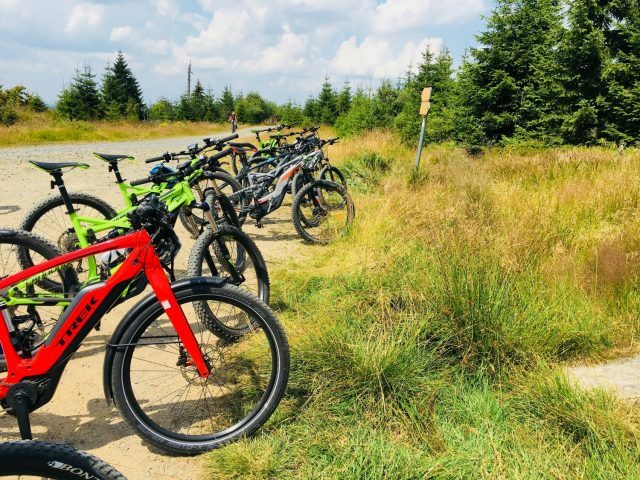 We took a guided 25 km electro-bike tour to discover Šumava National Park and had the best time exploring the plateaus, peaks, canyons and peatlands that team with flora and fauna. We were grateful for the ‘electric’ part of the bikes on a few occasions as there are some steepish ascents to contend with. And, of course, being in the Czech Republic we couldn’t go the day without a beer so our exertion was broken up with a beer and lunch stop at Brewery Modrava. E-bike rental is included in the price of the accommodation at Bed & Bike Prachatice and is a steal at just €100 per apartment. 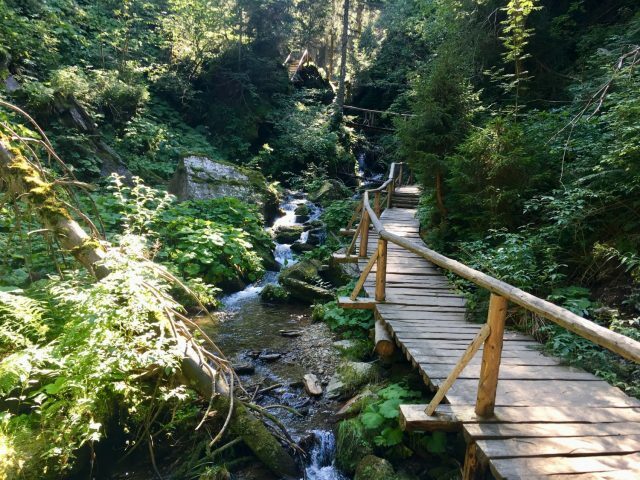 The Czech Republic is a dense network of hiking trails and cycling routes, some of which are international, passing into and even through neighbouring countries. There are far too many great hikes and cycle routes to detail here but I did a couple which I really enjoyed. One was a 14 km hike through the Bila Opava Valley to it’s highest peak Praded to spend the night in the TV Transmitter building. The other was through some of the woods and peatlands of Sumava National Park. If you like long distance hikes, one to add to your list is the Golden Path which connects Prague with Salzburg. Apart from my fun day out on the e-bike the only other opportunity I had to cycle was from Ostrava, across the Polish border to the town of Chalupki. Unfortunately, this ended in disaster as I got caught in a huge storm and had to turn back looking like a drowned rat. With all these activities to partake in, in the Czech Republic, you’ll need overnight accommodation at some point. For the budget conscious there are over 500 campsites in the Czech Republic, largely located along the myriad of wonderful hiking and cycling routes that navigate the country. 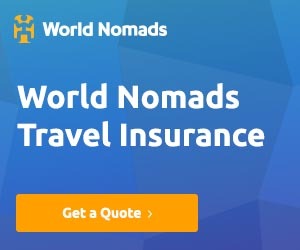 The beauty of these is that in addition to traditional pitches for tents, many also offer cabins, standard and luxury bungalows and rooms, and static caravans, etc. 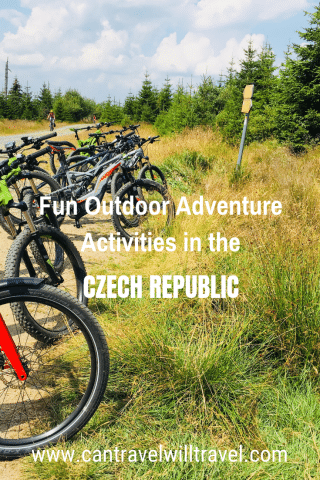 With such a huge variety of outdoor adventure activities to consider in the Czech Republic (and believe me I’ve only shared a very small sample here). I can guarantee you’ll be spoilt for choice. There’s something for everything, so go and get that adrenaline pumping. Have you been to the Czech Republic? What was your favourite outdoor adventure activity? Product Review Disclosure: Most activities mentioned were complimentary as part of pre and post tours and FAM trips for TBEX Ostrava 2018. These were in collaboration with Czech Tourism and various other partners. This did not influence my post in any way and as always I’ve provided balanced and honest reviews. I am a great adventure sports enthusiast, and this article make s a perfect itinerary for a person like me. I will share this article out there in the sports community. I am sure they will be happy to get such information around adventure sports! 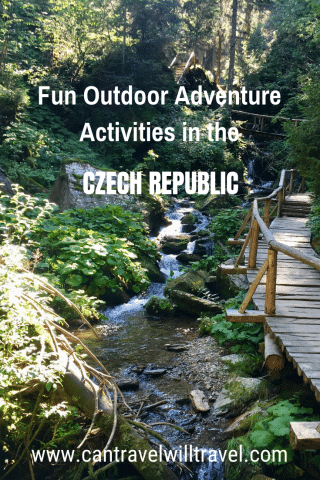 I’m so glad you found this helpful – Czech Rep is fantastic for outdoor adventure! Thankyou so much in advance for sharing! We visited Czech Republic last summer and missed all of these fantastic activities! We’ll absolutely have to return. Awesome, didn’t know that the Czech Republic offers so many outdoor activities, I guess it’s time for me to book a holiday in the Czech Republic. Thanks for all the tips! Yes there’s just so much to choose from. It’s fantastic. It makes me happy that we could be part of such a wonderful experience that you had in the Czech Republic. Best regards, Tanya! Great itinerary of outdoor activities, its wonderful to get out and have some adventures when traveling ! This looks like such an adventurous spot! I honestly had no idea but I would love to try all of these things while visiting! I am all about finding the adrenaline pumping activities when traveling too. It really is – I could quite happily have spent weeks exploring and trying out everything on offer – sadly there just wasn’t the time to do any more. Never seen those drift trikes before. What a fun way to experience Czech Republic! They were loads of fun, except for when my seat came unvelcroed and I ended up skidding part way down the hill on my bum – haha!